They are engaging, accessible and they have a wow factor. Even though you don’t mean to be impressive, people often think you are so creative and accomplished when you wield them. I just think readers are grateful for writing that includes little real-life stories. I know I always am. It’s simple: You want to read them. Who doesn’t want to know what happened next? How to Write an Anecdote. This post lists the basics of writing an anecdote–from starting at the peak of the action to using sensory details and dialouge. How to Turn a Real-Life Moment into an Anecdote. Learn how to take something that happened to you and tell it like a story using literary writing techniques. Find Your “Problems” for Great Anecdotes. Learn how to include something “that happened” in your essays as anecdotes to make them exciting and engaging. Essay Rocket Fuel: The Anecdote: This post gives an example of an anecdote and how to find the topic for an anecdote to use as an introduction for a narrative essay. How to Write Grabber Intros using Anecdotes. Hook your reader at the start by engaging them with a mini-story, aka anecdote. The BIG Difference Between a Story and an Anecdote: This post explains why a story and an anecdote are not the same thing, and how to use an anecdote to “show” a point instead of just “tell” about it. How to Find and Tell Anecdotes: This post teaches you how to find a good anecdote to illustrate the main point of your essay. Become a Storyteller in Less than Five Minutes. I love this post, if I don’t say so myself. It shows you with simple little line drawing how an anecdote fits into a narrative essay. Grab Your Readers with an Anecdote: This post walks you through taking a little incident or moment and time and spinning it into a short anecdote. Includes a sample anecdote. Components of an Anecdote: A good anecdote usually includes scene setting, so the reader can immediately start to visualize where something is happening. And something is happening–like a problem or action. It also will include details that help the reader step into the moment–hearing, seeing, smelling and feeling what was going on. The best anecdotes help readers experience the moment or incident by including bits of dialogue so they can get into the writer’s head and feel their pain, joy or other thoughts and emotion. HOT TIP: To start an anecdote for your narrative essay, begin by letting the reader know WHERE you were (just enough so they get the idea), and then put yourself in the scene. 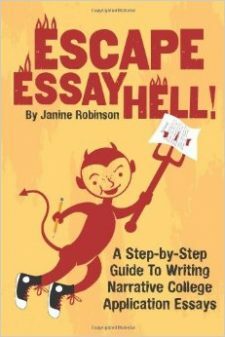 Want to write a killer college application essay? Start with an anecdote. You will leave the majority of other essay writers in your college application dust! so in order for it to be an anectdote it has to prove a point or have some type of lesson? Wow, what an excellent question. Technically, an anecdote is when you convey a moment in time and it reads like something out of fiction, or a novel. They are highly condensed and take only a paragraph or two at the most. I encourage students to try starting their personal essays for college applications with an anecdote as a writing device to engage (hook) the reader at the start. They work well because everyone loves a little story, as opposed to a gimmicky or too general opening line. Usually, an anecdote (or the moment or incident) will serve as an example of a larger point you want to make in your essay. It does not need to make a point or be a lesson in itself. For example, if you want to write your essay about how you are very creative, you could start your essay sharing a “time” or incident or moment where you did something creative. In that way, your anecdote serves as an example or “proof” of how you are creative. Instead of just telling about how creative you are, you start with a real-life example (an anecdote) of being creative. Does that make sense? How long should an anecdote be? How long is too long and how short is too short? GREAT question! In general, if you start your essay with an anecdote, I would shoot for one paragraph or a couple shorter ones. The idea is that you recreate a single moment, and start as close to the most exciting part as possible. (Usually that “moment” only covers a couple minutes) Then you shift into explaining the background or context of that single moment/incident/event in the following paragraph, and work from there.